Though tricky to pronounce (aw-rehk-KYET-tay), this playful pasta has remained a favorite by centuries of generations. Orecchiette originated in the Puglia region of Southern Italy (aka the boot's high heel). "Orecchio" means ear while "etto" translates to small, so these "little ears" live up to their name perfectly. 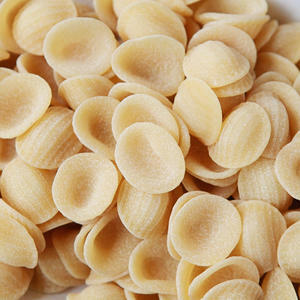 Legend has it that Italians would make orecchiette in times of famine as it can be stretched far and is ideal for drying. The Chinese have a similar version of this pasta knows as "Maoerduo" or, "cat's ears." Orecchiette pasta is great for holding sauces- you are sure to enjoy it in ournew Seasonal Menu, Spicy Puttanesca, Orecchiette with Olives and Pecorino. The capers and olives in this dish provide rich antioxidants that are protective of the skin and beneficial for circulation. Olives also contain a high amount of monounsaturated fat that is known to reduce the risk of cardiovascular disease.